This year is the 30th annual Act Belong Commit Zig Zag Festival! There have been thirty festivals since its inception in 1982. The Zig Zag Community Arts Inc have done an amazing job with the event – it’s entirely run by volunteers. Free entry, free activities, three stages, a parade, craft & food stalls. The theme changes every year and there are workshops during the school holidays leading up to festival where kids can build the main float for the parade. 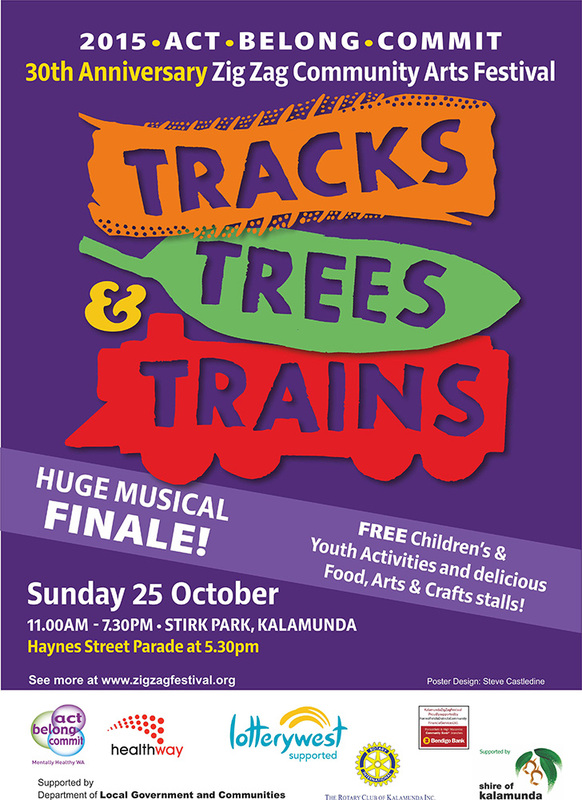 This year’s theme is Tracks, Trees & Trains. 2006 was my first year behind the scenes at the Zig Zag Festival, an annual community arts festival in Kalamunda. I was the official photographer’s assistant. It was up to me to follow him & speak to parents/guardians of the children he photographed, getting kids names & parent’s permission to use the photos in the paper or in future advertising for the festival. I took my digital camera (my SLRs back then were film, so I took my ‘compact’) & got a couple of my own photos too, when he left for his break. We were both extensively published that year, with a double page spread in the local paper & one of his images on the front page. The following year, I was there as the event’s secondary photographer (this time with DSLR in hand). It was my first event as an Official Photographer and it was awesome to be working alongside a photographer like Nathan. 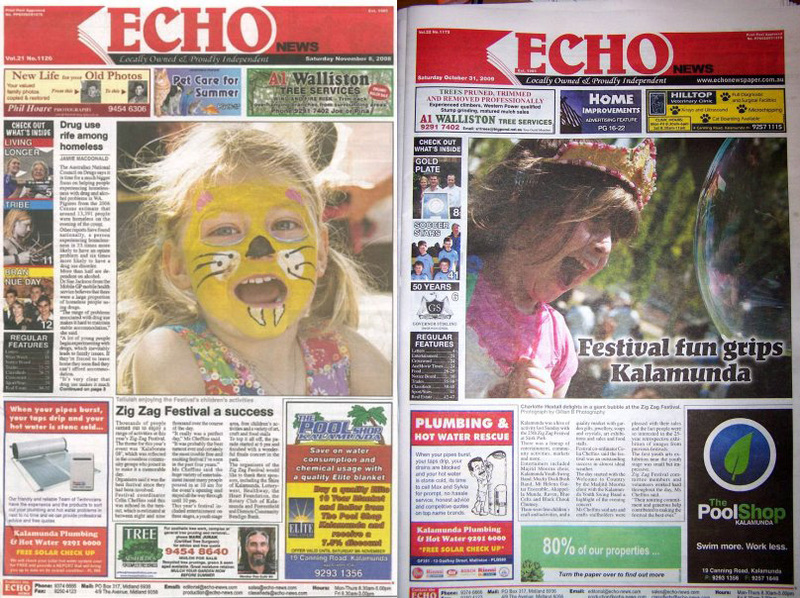 2008, my third Zig Zag Festival, saw my first front page news photograph. I’ve since taken on the role of main photographer, and am also one of the festival’s sponsors. This year will be the 10th Zig Zag Festival I’ve been involved with & photographing. I’ve watched so many kids grow up as they attend every year & smile for my camera. It’s a beautiful thing…. especially when they recognise me & come running over to show me what they’ve made this year in the free activity area, begging me to take their photo for the “maybe-paper.” Nothing in this job beats that. But I won’t just be photographing the festival, this year I’ll also have my own stall!!! 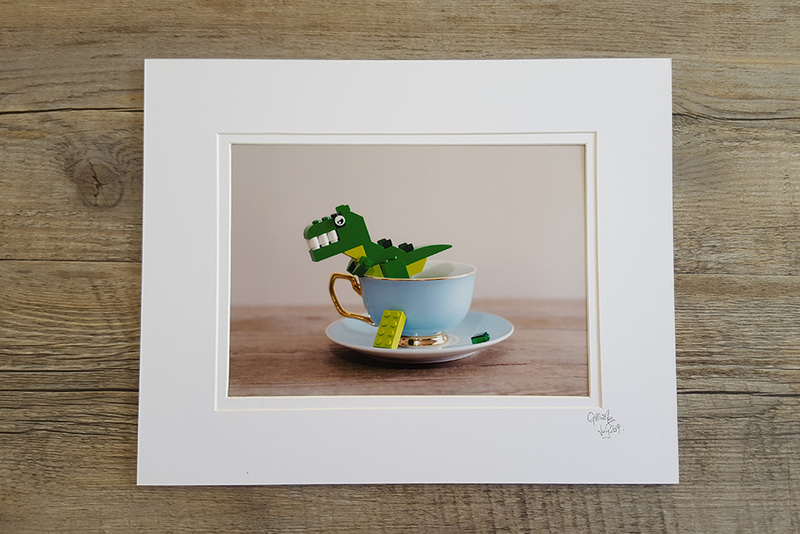 I’ve teamed up with one of my best friends who is an amazing artist – Paula Stirland – & we’ll be selling prints & paintings from the stall together. She’s going to have original artworks while I’ll have matted photographs & greeting cards (possibly even a little bit of clothing). Mostly my LEGO series to be honest, given it’s close to Christmas, is a family event, & those are the photos that everyone are requesting at the moment. I’ll also have my framed WW1 History series on display to order, with money from sales being donated equally between RSL WA & Legacy Australia. I hope to see you & your families at this year’s festival! It’s going to be a lot of fun!